Nowadays, it seems as though most of us have a limited amount of patience. We have quickly transitioned from a society content with waiting in line to an on-demand society with an abbreviated attention span. People are more than willing to speed through school zones, parking lots and other spaces with comparably low speed limits. This risky behavior puts us all at risk. Installing speed bumps, stop signs, yield signs and stop lights are some of the best ways to minimize speeding. When it comes to parking lots, installing speed bumps is often the sole means of keeping the flow of traffic safe and orderly. Do not select any old contractor when installing speed bumps. Carefully research local contractors until you find one that is worth your expense. Your contractor should comply with all local regulations, meet the proposed timetable and stay true to the initial project quote. When in doubt, compare references to gauge the merit of each individual contractor. Take some time to consider the specific reasons why this project makes sense for your unique property. If you are worried about speedsters making your parking lot dangerous or drivers using your parking lot as a shortcut, installing speed bumps would decrease those issues. Speed bumps slow down drivers, forcing them to focus on the road ahead. Think long and hard about the position of speed bumps before moving forward. The best speed bumps are positioned in areas where drivers are likely to cut across the parking lot and areas with heavy pedestrian foot traffic. The positions in which the speed bumps are placed throughout your parking lot ultimately determine their effectiveness. The strategic placement of speed bumps will reduce the chances of collisions with automobiles as well as pedestrians. It will help to occasionally maintain speed bumps with repainting. A fresh coat of paint ensures drivers can see the speed bump and slow their rate of speed. The addition of chevrons or candy stripes alert drivers that a speed bump is approaching. Vehicles that travel at a lower rate of speed over such bumps ultimately endure less wear and tear. Ask the experts to help you predict the flow of traffic across your property after installing speed bumps. Aside from complying with the nuances of the law, speed bumps must be carefully placed to facilitate traffic instead of slowing it. Cyclists, pedestrians and those with disabilities should be considered when the speed bump is installed. Even the speed bump’s potential impact on emergency vehicles must be considered before the project commences. You cannot install speed bumps in a random area at your preferred height and width. The dimensions of the speed bump must comply with local laws. Traffic Calming Guidelines have existed to standardize speed bumps and other strategies to slow down traffic. These rules are meant to prevent speed bumps from becoming too wide or tall and causing harm to vehicles. If the contractor you are considering does not broach the subject of compliance with the law, it is an indication that this group is unworthy of your business. The last thing you want is for your speed bumps to violate local laws and require a complete redo. 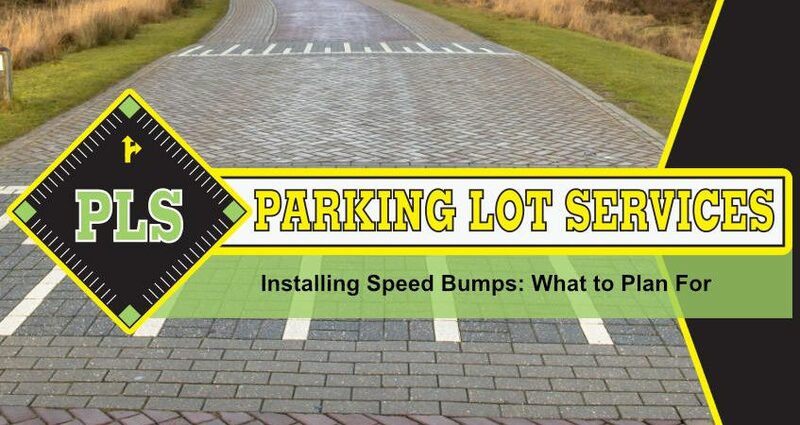 Are you considering installing speed bumps at your property? Let PLS paving services team do the work on your behalf. Give us a call at (813) 880-9100 to learn more asphalt repair in Tampa and our parking lot repair services. You can also schedule an initial consultation today.